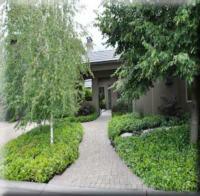 The typical suburban lawn consumes 10,000 gallons of water above and beyond rainwater each year. Here are some helpful tips in conserving water while still having a healthy and beautiful lawn. In general, most lawns require about 1 to 2 inches of water to keep the root system moist. The root systems of established lawns generally penetrate about 6 to 8 inches into the soil, although some warm-season grass root systems may extend even further. Deep and infrequent watering will help promote a vigorous root system. If under irrigated, cool-season grasses may become semi-dormant in the hottest part of the summer, returning to full vigor in cooler fall weather. Regular deep watering is necessary to keep the lawn green through the summer. Turfgrass water use rates, and the resulting irrigation need, also vary based on location and time of year. Don’t water the gutter & sidewalk. Position your sprinklers in such a way that water lands on your lawn or garden, not on concrete, where it does no good. Avoid watering on windy days when much of your water may be carried off before it ever hits the ground. Avoid runoff and puddling by spacing out, or cycling, irrigations. 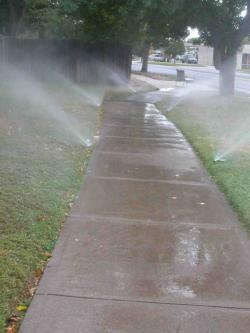 Let the sprinklers run for 10 minutes then shut them off for 10 minutes, allowing the water to absorb into the ground. The best times to water are between 2 and 8 in the morning. At these times, water use is most efficient, water loss from evaporation is minimal, and distribution is usually good because of good water pressure and limited wind. During the afternoon, water is wasted due to high evaporation rates. Do not water during the evening or pre-midnight hours because thatch and blades are susceptible to diseases if they are wet during cool nights. Check your sprinkler system for leaks and make necessary repairs. Lawns composed mostly of turf-type tall fescue will withstand drought conditions unless they are newly seeded or sodded.